Paul Townend aboard Gold Cup winner, Al Boum Photo. NOW THAT THE dust has started to settle, you can start to assimilate. It was an extraordinary week. Even for Cheltenham Festival week, it was an extraordinary week. If Klassical Dream’s victory in the Supreme Novices’ Hurdle on Tuesday under Ruby Walsh seems like a long time ago, that’s because it was, four days and 27 races ago, during which time you have probably been through a whole gamut of emotions. There were firsts. Gavin Cromwell had never trained a Cheltenham Festival winner before he put the saddle on Espoir D’Allen and legged Mark Walsh up into it, and sent the pair of them out onto the racetrack before the Champion Hurdle on Tuesday. There wasn’t that much talk about Espoir D’Allen beforehand, all the talk was of the big three, Buveur D’Air and Apple’s Jade and Laurina, and Mark Walsh wore the green cap with the white star that told you that he was owner JP McManus’ ‘second string’. But many a big race has been won in that green cap, and this was one of them, as the Voix Du Nord gelding carried it and Walsh to victory, 15 lengths clear of their closest pursuers. It wasn’t Mark Walsh’s first Cheltenham Festival victory, but it was his first Champion Hurdle, and he bagged his first Ballymore Novices’ Hurdle the following day when he booted City Island to victory. That was a first for Martin Brassil. The trainer sent out Numbersixvalverde to win the Aintree Grand National in 2006, but he had never tasted victory at the Cheltenham Festival before Wednesday. Brassil is an astute trainer, this is a deserved addition to his CV and, in City Island, he and owners Sean and Bernardine Mulryan have a young horse who could scale significant highs. Rachael Blackmore had never ridden a Cheltenham Festival winner before she went out on A Plus Tard in the Close Brothers Chase on Tuesday, but you wouldn’t have known it. She quickly had Henry de Bromhead’s horse settled into a nice racing rhythm, and jumping. She kicked on at the top of the home straight, sailed over the last two fences, and she didn’t look back until she was pulling up after she had crossed the winning line 16 lengths clear of her rivals. Then she went out on Friday in the Albert Bartlett Hurdle on the 50/1 shot Minella Indo, like A Plus Tard, trained by Henry de Bromhead, and she won on that too. A first Grade 1 winner at Cheltenham for the rider, a first Grade 1 winner anywhere. Thursday was a day like no other, with Bryony Frost winning the Ryanair Chase on Frodon and Lizzie Kelly winning the Brown Advisory Plate on Siruh Du Lac. And with Aidan Coleman kicking Paisley Park to victory in the Stayers’ Hurdle for Andrew Gemmell and Emma Lavelle. 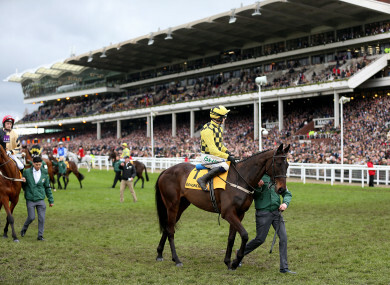 Then on Friday, Paul Townend rode Al Boum Photo to victory in the Cheltenham Gold Cup, a first Gold Cup for the rider, a first Gold Cup for trainer Willie Mullins. A Gold Cup without Willie Mullins’ name etched on it never sat comfortably. The best trainers win the best races, that’s the way it is. Willie Mullins is one of the best trainers of racehorses that there has ever been, and the Gold Cup type of horse is the type of horse in which he majors. He had gone close in the past. Florida Pearl finished second and Hedgehunter finished second and Sir Des Champs finished second and On His Own finished second and Djakadam finished second. Twice. Now that he has won it, the seconds can be regarded as stepping stones, not frustrations. There were lows. We lost Ballyward and we lost Invitation Only and we lost Sir Erec. It is the worst thing when a horse is lost, and it upsets those who are closest to them more than it upsets anybody. There were lasts. Noel Fehily won the Mares’ Novices’ Hurdle on Thursday on the 50/1 shot Eglantine Du Seuil, and promptly announced his plans for retirement. There were returning champions, Altior in the Champion Chase, Tiger Roll in the Cross Country Chase, and there were coronations, top rider for the week Nico de Boinville, top trainer Willie Mullins, top owner JP McManus. And there were lasting memories. Email “Donn McClean's Cheltenham review: Lasting memories will endure after an extraordinary festival”. Feedback on “Donn McClean's Cheltenham review: Lasting memories will endure after an extraordinary festival”.